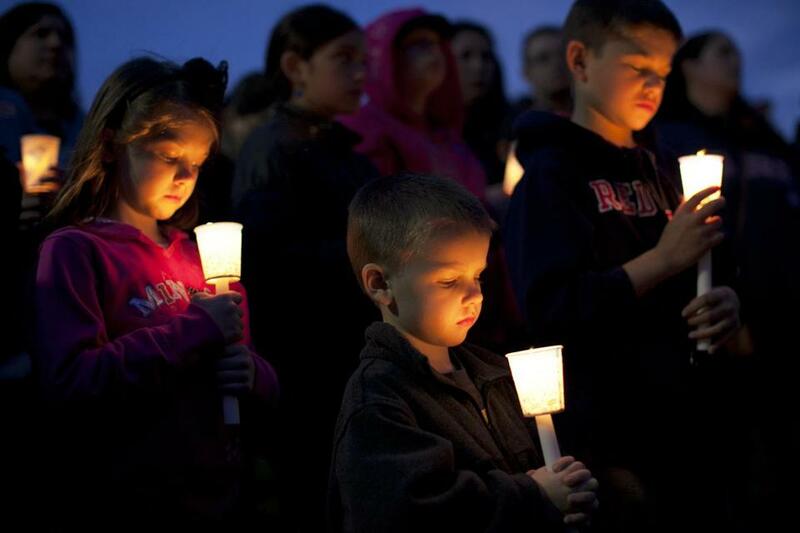 Emily Gillis, 7, brother Conor, 4, of Dorchester, and their cousin Benjamin McCormick, 8, of Milton were among those at a vigil Tuesday night at Garvey Park in Dorchester in memory of Martin William Richard, 8, killed in the bombings. First came the horror. Then came the desire to help. And by Tuesday evening, as the first 24 hours passed and shock became grief, the people of ­Boston gathered to begin what will be the longest chapter in the story of the Marathon bombing: the healing. 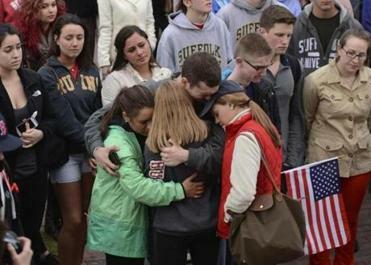 Across the region, thousands came out for vigils to honor the victims of the ­Marathon Monday attack, holding candles, reciting prayers, and vowing to never forget. At Garvey Park in Dorchester, more than 1,000 friends and strangers came out to honor 8-year-old Martin Richard, a neighborhood boy who was one of the three people who lost their lives in the attack. Richard’s sister and mother were seriously injured. Mary Solomon, a volunteer at the finish line, embraced sorority sister Briana Simicic at a Northeastern University vigil. At Northeastern University, students and faculty spilled out of a separate vigil in a campus ballroom, sharing hugs and words of encouragement. At Brandeis University, more than 50 students and faculty gathered for an emotional multifaith memorial around a small pond on campus. “We are reminded all over again that sometimes we have very little or no control over the circumstances we will face,” said Fred Lawrence, Brandeis president. 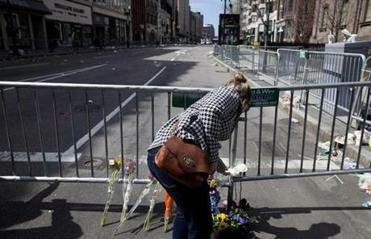 A vigil and memorial at the Boston Common park stand. For those who came out to the vigils, the night was about being together as a people, about starting the process of repairing the emotional damage to themselves, and the larger community. In Dorchester, Ann McGinn walked a mile from her home to get to the gathering, despite medical problems that usually prevent her from walking short distances. She had spotted two women in the crowd wearing Marathon jackets and approached them to thank them for showing up. Those women, sisters Jeanine and Pamela Butz of Boston, were about to finish their first Boston Marathon when the explosions occurred. They said they knew they had to come out in support, but thought long and hard about whether it was appropriate to wear their jackets. “It’s a very heavy feeling wearing this jacket,” said ­Pamela, 22. At Northeastern, Joseph E. Aoun, president, told the crowd that some had suggested it was too early to have a vigil. He disagreed.